"To service customers with a labor force of skilled craftsmen, available for dispatch to all types of industrial construction or repair projects." Through the years and the growth, our core values have remained. The grass-roots American “can do”attitude which fostered the beginning of A-Lert survives and thrives today. 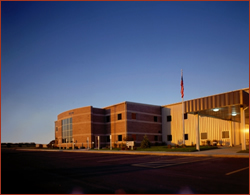 A-Lert Construction Services continues to be headquartered in Fredonia, KS, but also maintains regional offices in Illinois, Iowa, Georgia, and North Carolina. As industry-leading self storage builders, A-Lert Building Systems specializes in planning and site layout, design, and construction of self-storage buildings and is headquartered in New Braunfels, Texas. A-Lert Roof Systems, also located in New Braunfels, Texas, specializes in standing seam metal roof systems. The A-Lert group is a part of Centurion Industries, Inc., headquartered in Garrett, Indiana (pictured here).